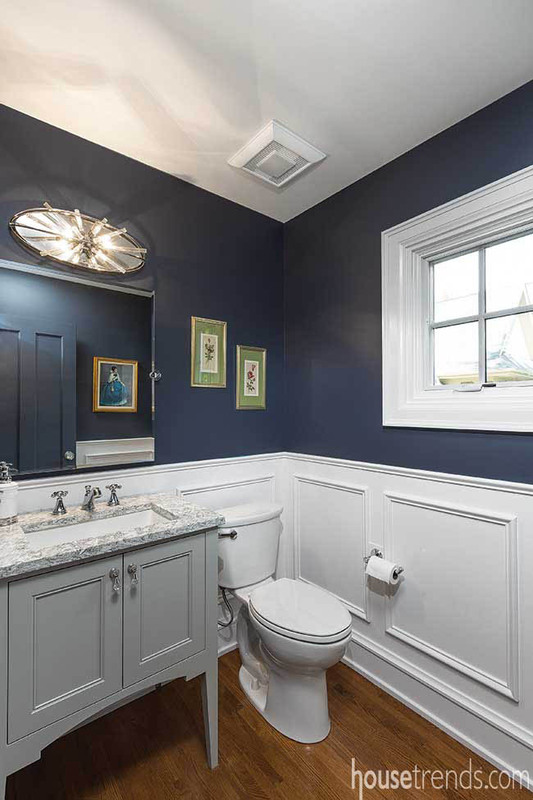 In this handsome half bath, the designer created a wall treatment that, while it looks like custom paneling, is actually a simple applied wood molding done with 3/4″ wide squared MDF trim. 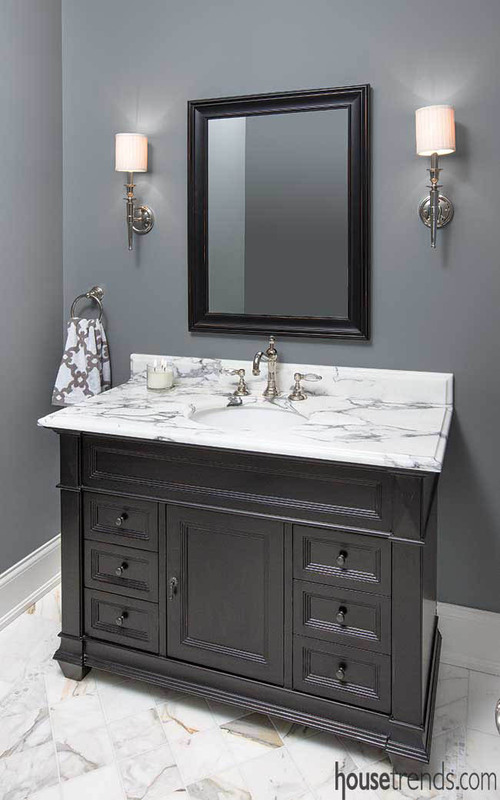 Even though they are typically the smallest rooms in our homes, powder rooms often get showered with more than their fair share of pizazz. 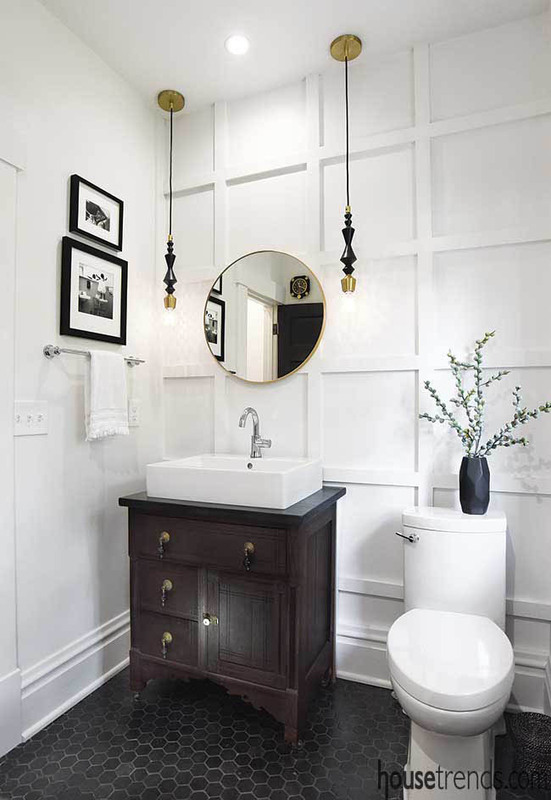 The four basic elements necessary—vanity, toilet, lighting and mirror—take on an inviting appeal when extra touches on the walls, floors, and even sometimes the ceilings, come in to play. 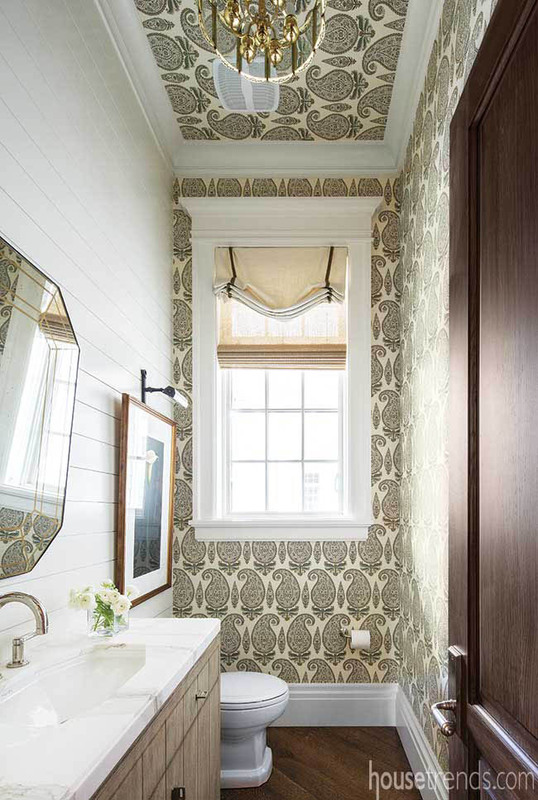 F Here we have three collections—showcasing tile, wood and wallpaper—that illustrate how these surfaces can add a whole new layer of personality. By simply adding a grid of 1″x 3″ strips of poplar to this accent wall, the designer added a classic element to the space with a subtle touch. While it is painted a crisp white, the wall is anything but plain, as the wooden details transform it from a simple white wall to one with dimension and shadows. 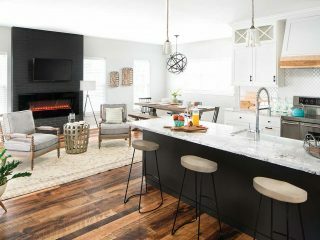 Wanting to keep with the traditional feel of this home, which was built in 1918, the designer matched the detail of the dining room’s wainscoting for this adjacent half bath. 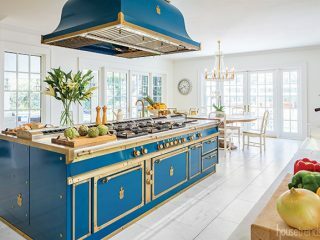 Seen in the mirror is a blue door that swings between this room and the butler’s pantry which has its walls, cabinets and ceiling all painted the same blue. 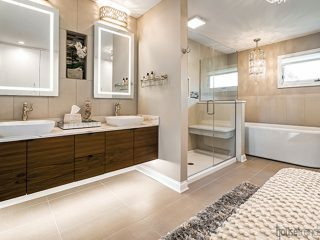 In this handsome half bath, the designer created a wall treatment that, while it looks like custom paneling, is actually a simple applied wood molding done with 3/4″ wide squared MDF trim. 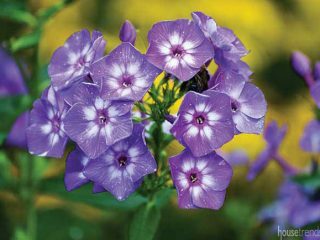 Then she painted it the wall color in a high gloss sheen to make it more durable. 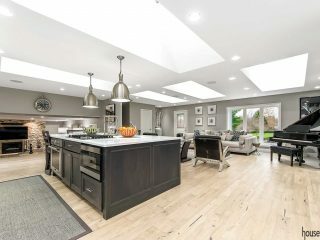 Wanting this room to be really special, the homeowner was willing to take a bit more of a risk with its design. The first sample of this wallpaper the designers showed her was taupe. When she saw the color options she decided to go with the dramatic black version. The designers agreed it was the perfect choice. 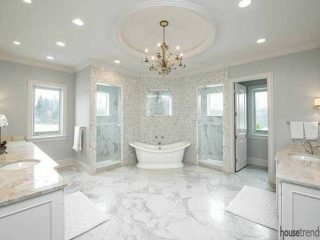 This powder room was relocated to allow more space for a kitchen renovation. 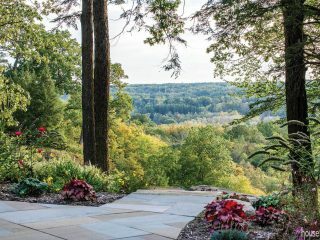 Its new hallway location fits the natural flow of traffic through the home. 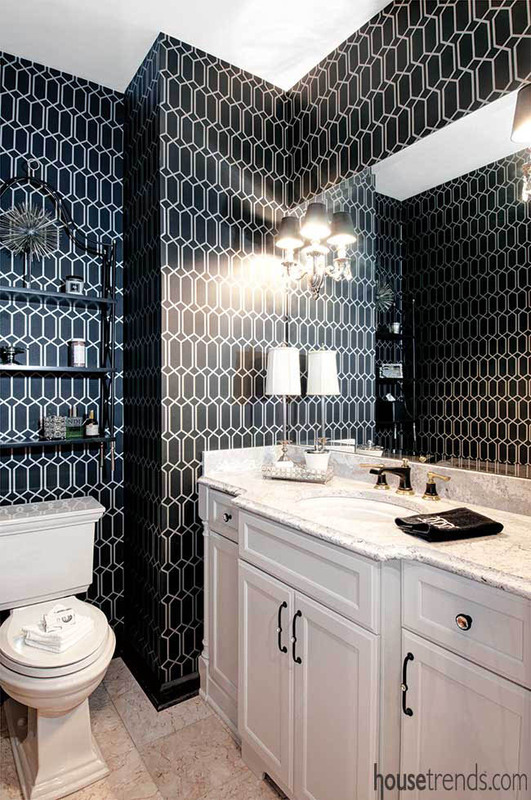 The wallpaper is layered with a diamond and arabesque trellis, and atop that, an ogee design. The variety of textures, lines, and colors create a pleasing large-scale look. 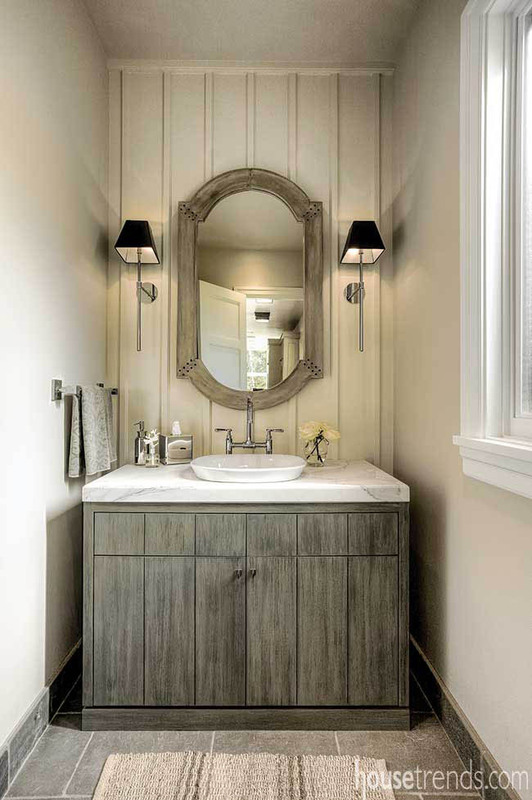 Creating a new space while using the owner’s vintage mirror and chandelier demanded a mixture of classic fresh elements such as; white painted nickel board, a polished nickel faucet, and a marble countertop. 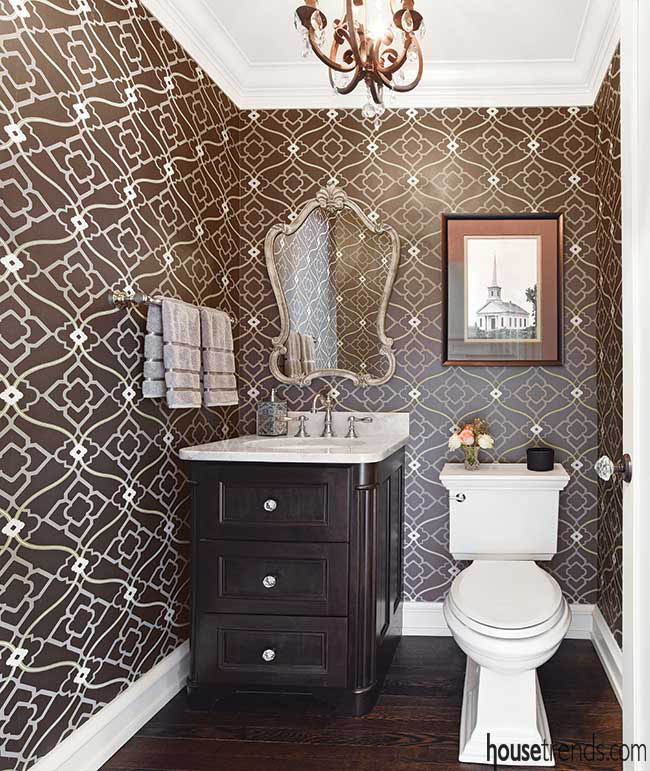 When paired with the paisley wall covering and the Roman shade the designer created a soft welcoming half bath. 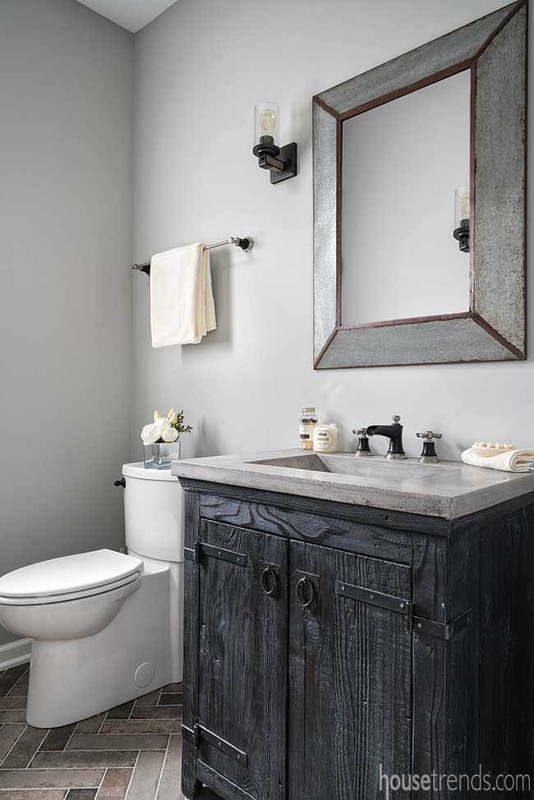 To add to the modern farmhouse feel that runs through the rest of this home, the designer chose brick-size tiles for this bathroom’s floor in colors that picked up on the vanity and countertop. 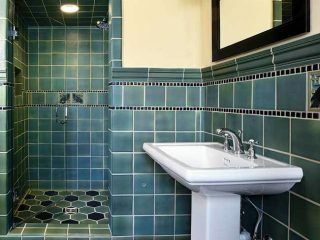 The tiles were installed in a herringbone pattern to give it a bit more of a punch. 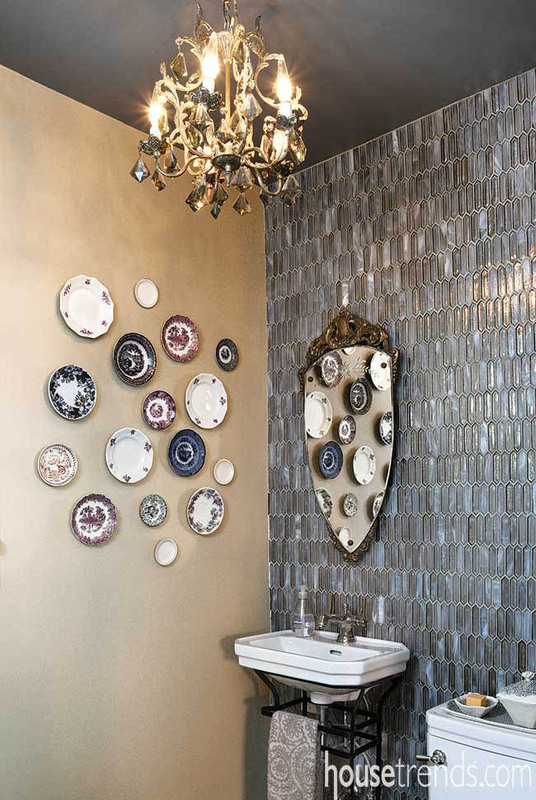 A great deal of personality is packed into this small powder room with vintage pieces stealing the show. 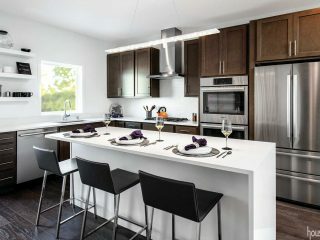 A wall of elongated hexagon-shaped silver glass tile with touches of soft grays, browns and whites adds a visual dimension that shifts endlessly with the play of light and shadow.